OK, so it’s October and the election is coming up pretty quickly. A few items that may interest you. 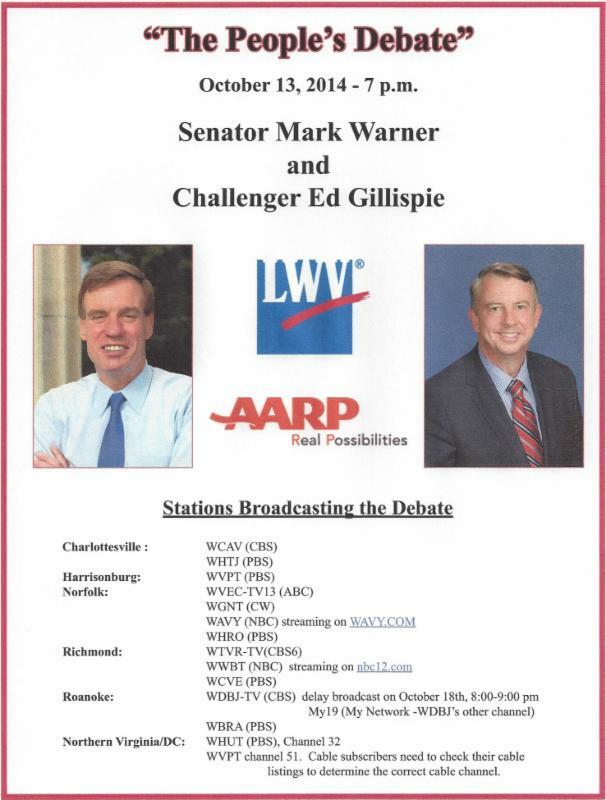 Virginia Senate Debate – Tonight (10/7), 7pm, TV broadcast on local NBC stations and CSPAN2. Moderated by Chuck Todd of Meet The Press. “The People’s Debate” – October 13, 7pm, TV broadcast. Sponsored by the League of Women Voters and AARP. In Hampton Roads, it will be available on WVEC, WGNT, WAVY, and WHRO. Click on the picture to see the stations in your area. Candidates Forum – October 18, 10am, Chandler Recital Hall of the Diehn Fine & Performing Arts Center. Sponsored by the League of Women Voters of South Hampton Roads, Norfolk NAACP, ODU NAACP, and ODU Student Government Association (details – pdf). I’m told this is the only time the two candidates will appear together as there are no other forums or debates scheduled. Norfolk elected school board. A question of whether or not Norfolk should elect its school board will be on the 11/4 ballot. Norfolk GAINS Referendum Roundup – October 23, 6pm, Norfolk Tech Center. Moderated panel discussion. As I hear of more events, I’ll post them. Previous Post Oh happy day!